On this forum we have read accounts of Gursikhs like Bhai Manee Singh Jee, Baba Gurbaksh Singh Jee, Baba Deep Singh Jee, Bhai Daya Singh Jee, the Tath Khalsa, Shaheedeean Misl, Shaheed Singhs and even Guru Gobind Singh Jee wearing the Blue Bana. There are further accounts of other GurSikhs wearing blue including the Sahibzadas. Some have tried to explain the description of wearing of Blue from historical sources and in turn have tried to undermine its significant in the Khalsa’s form but they have failed to be convincing. It must be more than just a coincidence for so many old historical accounts to state the colour blue. Although there have been occasions were Kesree and white have been mentioned but these however have not been as extensively as Blue. Kesree has been mentioned as the colour worn by some GurSikhs on their Shaheedee. White and Kesree have been worn on certain sevas but blue has been the colour worn generally. Colour it self does not mean much on its own but when it becomes the colour of the uniform worn by a body then it has a value. Any army has a uniform and this uniform is the same through out, that’s why it’s called a uniform. A uniform gives the appearance of discipline, identity, equality and unity amongst its wearers. In a battle a uniform produces these effects on its enemies many fold. Guru Gobind Singh Jee when introducing the khalsa in 1699 produced the Panj Payare in Blue for the world to see. Thank you for the references, ਖਾਲਸਾ jee. 1.When Guru Gobind Singh Ji baptized the five beloveds they came out from the tents wearing a blue attire. 2.There is one saying which laid the foundation that every Nihang will have to wear blue clothes. 5.When Mata Gujri saw her grandson in the blue uniform she said your great grand father the sixth Guru used to dress up in a same way. When they all came in front of Guru Gobind Singh Ji, he said that this is the most sacred wearing and reflects a true Khalsa. Later he (Guru) declared that every true Khalsa will have this appearance which reflects "Akal Purkh de Fauj". This place where guru founded the Khalsa panth was known as ‘Damal Gargh’. 6.Hemkunt Sahib: Kamarkasa Compulsory: It is also compulsory to wear the Kamarkasa for every individual who is on pilgrimage to HEMKUNT SAHIB. In fact Nihang Sikhs still wear the Kamarkasa till today. “The Blue Colur signifies the believe in Peace and Non-Violence. The Chakuta (head dress)signifies a Child asking forgiveness from his Father, the Almighty Lord"
The following was posted on this website a while ago in response to claims that Blue was not the colour of the Khalsa. I applaud Amritpal Singh for his analysis of Snatani practices. But as they say, we shouldn’t throw the baby out with the bath water. I was concerned to see him try to dismiss Blue as a Khalsa colour. 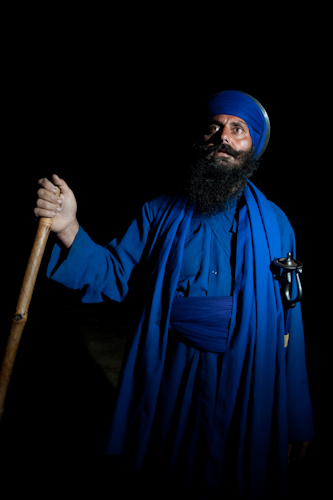 Blue has traditionally been worn by the Khalsa along with orange and white. Black is also acceptable but became popular later on. I and some other Singhs were discussing Amrit’s article on blue clothes and one Singh asked why “neel bastar” were described as being Muslim colours and why the Khalsa now wears neela. Muslims are not discerned by blue clothes now. In the past Muslim dress has always been thought to have been green (haideri) and Muslim Ghazis are known to wear Green clothing. Why does Gurbani say blue? A Singh from Kashmir (Poonch) was sitting with us and he said that where he is from, the locals call green “neela”. They call green chilis not “haree mirch” but “neelee mirch” they call green grass “neela ghaa”. This explains it. For people of that area, neela meant not blue, but green. What Did Guru Gobind Singh Wear? There has been an attempt to say that Guru Gobind Singh jee only wore blue when leaving the forest in Macchiwara. The oldest account of Guru Gobind Singh jee and the formation of the Khalsa is the Bhatt Vehis. What do the Bhatt Vehis say about what Guru Sahib wore when the Khalsa was created? So blue was the colour the Khalsa was first given according to the oldest source. Aap Snaan Karyo Sah Kesan, Kesree Khyom Patam Pahraaye. From the foregoing analysis of various texts, we can conclude that Guru Gobind Singh Ji wore clothing of various colours and that to assert that he wore only blue attire after the inauguration of the Khalsa in 1699 is wholly incorrect. No one denies that kesri is an acceptable colour. Punj Pyaaray today generally are all dressed in kesri robes. Kesri is considered a royal colour. The fact that Guru Gobind Singh jee was wearing kesri only says that kesri is an acceptable colour for the Sikhs as well, not that blue is not special or unacceptable (as the article seems to suggest). What would surprise me would be if Amritpal Singh could show me any reference to Dashmesh Pita jee wearing something besides Blue, White, Kesri or Black. That would be a find. Clearly, Blue was a special and acceptable colour of the Khalsa. Guru Gobind Singh jee being royalty, wore kesri as well (as our royal Punj Pyaaray still do today). This is not a surprise, but to be expected. As I said before, Kesree is the royal colour for the Sikhs. It is no shock that the princely Sahibzadas would have worn this colour. The colour red has been forbidden amongst the Sikhs since the start. It is not an acceptable colour for Sikhs to wear. Bhai Daya Singh rehitnama tells us that those “who use colour prepared from red ochre or the kusumbha flower” are tankhaiyas. It says plainly, “Bastr kusunbhay na pehray” or “Do not wear clothing which is coloured red. ”(verse 23). Bhai Prehlad Singh Hukumnama also tells us, “soohay anbar pehn kar jo naasay nasvar…” “He who wears red clothing, or inhales nasavar up his nose will be beaten about the head and thrown into hell” (verse 12). Who was Sukha Singh? The fact is that he NEVER SAW Sahibzada Baba Ajeet Singh jee. On what basis is he giving such a detailed description besides his own imagination? Sukha Singh was born in 1768 and wrote this in 1797. After a hundred years, how would he know what Baba jee was wearing? This is clearly his own literary imagination at work, not a statement of fact. Tan Dhare Bastar Kesree, Dastaar Ooch Sajaaye. (He wore saffron robes and tied a high turban). Kisai Pushaak Thee Neelee Sajaayee. Kinai Set, Kisai Kesaree Rangvaayee. This is no big finding. It goes with what has always been known. White, Orange and Blue are all Khalsa colours. It doesn’t say here that they wore green or red. Only Orange, Blue and White. This is in complete accordance with Khalsa Tradition. I’m not much moved by the descriptions of Singhs in only kacherras and blankets. Singhs in those times had very little. Depending on the condition of the weather and their own economic condition, it is possible they wore very little. But that does not go to say that Sikh dress is no dress at all. Clearly this dress was functional for the circumstances. Even today some bana-wearing Singhs will wear only a fatoohee (short kurta) when they are training for gatka or some other circumstance, but that doesn’t mean this alone in isolation is the dress. Blue dress is not something recently invented for the Khalsa. As mentioned before, Bhatt VEhis tell us that Guru Sahib himself dressed the Khalsa in Blue. Furthermore, the vaar “Vah Vah Gobind Singh Aapay Gur Chela” we all sing, tells us about the creation of the Khalsa as well. See the last line. It says that “thus the Bhujangi Singhs were created, dressed in blue”. The puritan Rehitnamas also tell us that Blue is a Khalsa colour. Bhai Daya Singh’s rehtinama tells us that a Khalsa colour is “surmaiee” or dark blue (verse 23). He goes on further to say , “So Akali rooop hai neel bastar dherai” or “An Akali is known by the blue garments he wears”. Clearly blue clothing was a special Khalsa colour! “ ਨੀਲ ਪਹਿਰਨ ਤੇ ਦੂਰ ਕਰਾਯੋ॥ ਸਮਰਾ ਸੂਹਾ ਸੀਸ ਬੰਧਾਯੋ॥ "
meaning, “he tried to wean them away from blue. He made them tie red on their heads” The Khalsa would not give up blue and could not wear red, so a split occurred. Thus you can see that the Khalsa did indeed wear blue clothing and considered it their “special” colour, not just one colour amongst many others. I have not written this to be a comprehensive article in support of blue. That would require a lot more research and that is something I don’t have much time for at the moment, but I did want to give an answer to the article on blue clothing. It is also a fact that prior to the 1950's MOST Gurdwars in Malaysia/Singapore/Thailand/Indonesia had BLUE Nishan Sahibs with Black Khanda. Kesri Nishan Sahibs were almost never seen anywhere. 1.After the Akali Dal and the Jan Sangh became "wedded" couple..and the Akali dal Badal became MRS. BJP....the Kesri Colour began to come more and more prominent...and this trend also began to catch on in this region..NOW one cannot Find even a SINGLE BLUE Nishan Sahib anywhere - not even inside the Gurdwaras. ON my travels to Punjab too, I found Blue Nishan Sahibs as common as bird's milk..only Nihung Gurdwaras had these...so it seems that only the Gurus laadlian faujaan..the Nihungs keep to Blue..
2. Guru Klagidhar's horse was also called NEELA...one of Guru jis "titles" ( for want of a better word ) is Neelehh da Shah Swaar..Neeleh ghorrian waalha Sacha Patshah. 3. Many paintings of the 1699 Vasakhi show Guru ji and the Panj in Blue. ARE YOU SURE THIS ACCOUNT IS RIGHT, IF YOU LOOK AT THE DATE IT SAYS 1752, I THOUGHT VAISAKHI WAS ON 1699. Jaskirat Singh jee, I don’t think the shade of blue has to be perfectly matched. Different shades of Dark Blue and Royal Blue do blend together. The picture of your link shows this as you can see the Jathedaar of those Singhs wearing a slightly darker blue than the others but it does not cause a distinction. If an enemy was to view you from distance they will not notice the difference. I think most accounts give the reference of Neela, surmaiee is not vastly stated. I think people have interpreted surmaiee differently. It is also important to note that I feel the blue should not stand out in the night sky. It should be able to give a reasonable camouflage. I think light blue is a shade too distinct, so I have my doubts if this is OK. Having said that I do have a light blue Chola but I rarely wear it. Below is a passage from Twarikh Sikhan written in Farsi by Munshi Khushwaqt Rai in 1811. He is a non Sikh so he sees things in a different light, some things written in his book do not comply with Gurmat nor are some of his comments very respectful. However it is very interesting to read what he has observed, heard and may have read. I don’t claim to know Farsi so the above is just a generalisation of what has been written, it is not a word for word translation.